Long ago were your college days of meeting a new girl in psych class or bumping into Mr. Right at a mixer with your favorite fraternity. As a busy adult in the big city, meeting a new guy or girl that you can trust or who has similar interests can be tricky. Tired of the bar scene? Done with online dating? 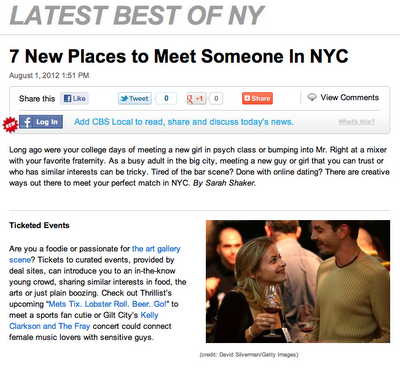 There are creative ways out there to meet your perfect match in NYC. Thanks for share this article with us this places to meet someone are incredibles.